Unless you've been floating in space in a stasis tube the last couple of weeks, you'll know that Pokémon Go, Nintendo's second foray into the world of smartphone apps, has become a global phenomenon bordering on the obsessive. The augmented reality app maps out your location and ties gyms, item-filled Pokéstops and random Pokémon appearences to real-life locations - the only problem is you can see the area in which you're currently using your phone. So how about a tool that maps the entire country (and the world, for that matter), picking out all the key locations for bagging every single one of those Japanese monsters? That's why no-contract telecomms firm giffgaff has helped develop find.catch.share, a browser-based mapping tool that shows you best places to nab those rare and difficult to find Pokémon. Need to bag a Mewtwo? Struggling to find a Blastoise? find.catch.share will have you covered. The software was created in parternship with what3words, a unique company that has addressed every 3m x 3m square of the planet with a unique, fixed address made of just 3 words. The idea is to mark out key hotspots as well as mapping Pokéstops and gyms. 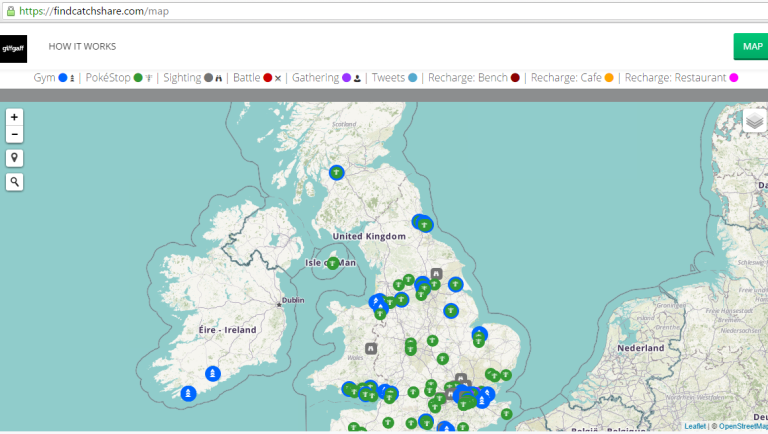 The free service even shows you recharge stations around the UK, for when your smartphone battery inevitably gives up the Poké ghost. If you like the idea of checking out hotspots in your area, and beyond, check it out here.